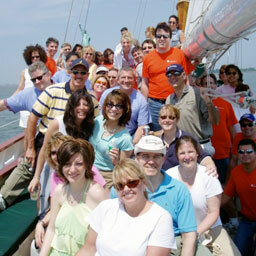 Soak up the spring time sunshine and cruise with us for a Boston Harbor sightseeing boat tour! It is that time of year to sail with us through Boston Harbor! Enjoy an evening out in Boston Harbor aboard a classic yacht for one of our special events. At Classic Harbor Line, we are dedicated to providing the most impeccably luxurious and hospitable sailing experience in Boston. Our guests can look forward to the privilege of being escorted on a breathtaking excursion aboard the most elegant sailing vessel in Boston Harbor, the schooner Adirondack III or a relaxing cruise aboard the motor vessel Northern Lights If you are a first time visitor or a seasoned local, an excursion aboard one of Classic Harbor Line’s yachts will provide you with a new perspective on the city of Boston. While aboard our stylish boats, you will be treated to views of the spectacular Boston skyline, historical sites, harbor islands, and perhaps a glimpse of some of our elusive wildlife, such as: the harbor seal. So, come on out and experience the best sightseeing adventure in Boston! And please, kick up your feet because we’ll do all the heavy lifting (and drink pouring)! There are two ways to cruise or sail with us, you may purchase tickets for one of our public events aboard the schooner Adirondack III or motor yacht Northern Lights or you may privately charter either boat. Tickets aboard our schooner are available for purchase on a Day Sail, Sunset Sail, City Lights Sails, Boston Harbor Island Picnic Sail, or our Sails & Ales featuring Harpoon Brewery. Northern Lights offers tickets on our One-Hour Inner Harbor Cruise and Sunset Cruise. Consider the schooner Adirondack III or yacht Northern Lights if you are looking for a new and exciting experience to host your next company outing or celebrate a milestone such as: a wedding, anniversary, or birthday. Adirondack III is certified to carry groups of 40 or less, while the yacht Northern Lights is suitable for groups of 149 or fewer. To get more information on privately chartering the schooner Adirondack III or Northern Lights for your next event, go to our Private Charters page. Either way you choose to experience Boston Harbor with us you will be pleased to find our vessels in excellent condition, with comfortable seating, and the most hospitable crew in Beantown. Classic Harbor Line is known for operating some of the most stunning sailing boats and classic yachts in New York, New York; Newport, Rhode Island; Key West, Florida; and Boston, Massachusetts. In addition to our beautiful vessel, we are also renowned for our excellence in hospitality and customer service.